It's judgment day for Brett Kavanaugh and the three crucial Republicans who could send him to the Supreme Court or doom his hopes of being the swing vote who could change America. Kavanaugh's fate will be on the line for the second straight Thursday, as senators begin reading the results of the supplemental background check compiled by the FBI a week after Christine Blasey Ford accused the nominee of sexual assault in the most politically charged hearing in decades. Republican Majority Leader Mitch McConnell meanwhile set in motion a process designed to lead to a procedural vote on Kavanaugh's nomination on Friday, that would possibly lead to a final vote as early as the following day. The six days that have elapsed since the hearing have only made the confirmation showdown for President Donald Trump's pick more divisive and deepened the cavern of mistrust between Republicans and Democrats on Capitol Hill, just five weeks before midterm elections. Confirming Kavanaugh under such circumstances could stoke GOP turnout in the elections and reconcile the decades-long goal of a conservative majority on the Supreme Court. But it also seems certain to further alienate women voters in the #MeToo era in a way that could have huge implications in November and in Trump's re-election race. While Kavanaugh has the most to lose, and Ford is waiting to see whether her decision to shatter her own privacy in a hearing watched around the world will have any effect, the next few days promise to be agonizing for three Republicans senators who control the judge's fate. Fierce pressure is building on Arizona's Jeff Flake, Maine's Susan Collins and Alaska's Lisa Murkowski, who have all expressed reservations about Kavanaugh, and face a choice with stark implications for their political careers and legacies. "Everyone has asked 'what's it going to say? How am I going to react?' I have no idea, in truth and fairness. I have no idea, so I'm going to wait," Murkowski told reporters on Wednesday. The decision for Collins and Flake may have been further complicated Wednesday night when Kavanaugh's former Yale roommate, James Roche, alleged on CNN's "Anderson Cooper 360" that Kavanaugh lied about the extent of his drinking during last week's wrenching hearing. Both senators have drawn a red line on their votes on Kavanaugh, saying they will not vote to confirm him if they believe he lied under oath. "We were in a room together -- our beds were 10 feet apart for a couple of months," Roche told Cooper. "And what struck me and made me more interested in speaking out about it is not only did I know that he wasn't telling, you know, the truth, I knew that he knew that he wasn't telling the truth." Sources told CNN that senators will be allowed to start reading the FBI investigation summaries on Kavanaugh Thursday morning. The probe was re-opened last week after Flake, concerned that the bitter imbroglio of Kavanaugh's confirmation process was tearing America apart, made his vote conditional on further investigations of Ford's allegations, dating from the 1980s when she and Kavanaugh were high schoolers. Trump, hoping to soon celebrate a second confirmed pick to the Supreme Court that would deliver a consequential legacy, quickly took to Twitter to create momentum behind Kavanaugh. "Wow, such enthusiasm and energy for Judge Brett Kavanaugh. Look at the Energy, look at the Polls. Something very big is happening. He is a fine man and great intellect. The country is with him all the way!" Trump wrote. When senators get their first look at the FBI summaries, it will be a critical moment for Kavanaugh. It is likely to quickly become clear whether they give the three Republicans political cover to vote for, or against Kavanaugh and whether Democrats consider the FBI's efforts, under the direction of committee Republicans and the White House to be a genuine investigation. The findings could shed light on the credibility of Ford's accusations, the sustainability of Kavanaugh's denial and wider questions about the judge's character that have exploded into the debate over his prospects since his volatile performance during last Thursday's hearing. The report could also shed some light on Kavanaugh's candor and truthfulness, which have also emerged as a potential challenge to his nomination. The extent of the Kavanaugh's drinking and partying in the 1980s does not directly touch on whether he is qualified to sit on the Supreme Court decades later after a distinguished career as a jurist. 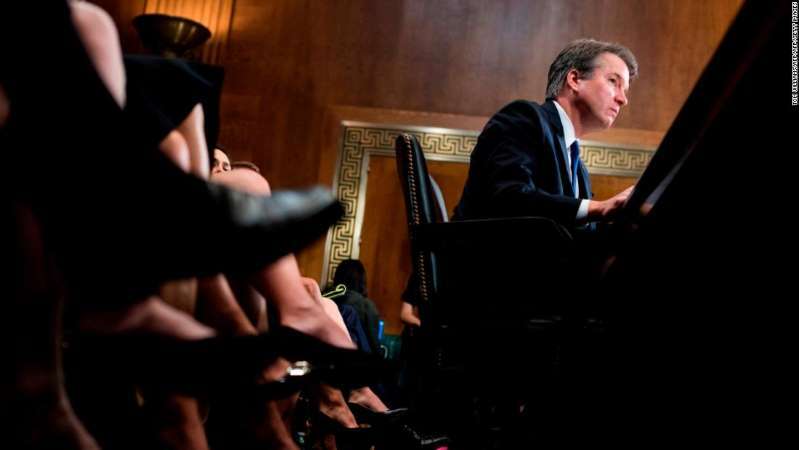 But if information emerges to contradict his assertions that he never blacked out while drinking it could cast doubt on his denials that he did not assault Ford at a house party in the 1980 since she testified he was heavily drunk at the time. Kavanaugh could also face questions if there are suggestions in the summaries that he did not tell the truth under oath about his past, since he is auditioning for a job on the highest court in the land that relies on the idea that its members are themselves beyond legal reproach. Among those interviewed by the FBI was Mark Judge, a friend of Kavanaugh's who Ford said was in the room at the time of the alleged assault. Ford's attorneys said in a statement late Wednesday night the FBI had not contacted Ford for an interview, leaving them "profoundly disappointed that after the tremendous sacrifice she made in coming forward, those directing the FBI investigation were not interested in seeking the truth." It would take something substantial to change in the perception of Kavanaugh's past and character to change the fervent desire of most of the Senate GOP to get him confirmed quickly. The three key Republican senators all criticized the President on Wednesday after he went on the attack against Ford at a campaign rally. In a rare appearance in the White House briefing room, spokeswoman Sarah Sanders denied Trump mocked Ford and instead unleashed a barrage against Democrats she said had made the judge and his accuser "victims" of a politicized effort to kill the nomination. Her anger appeared to reflect real frustration in the White House that the week of limbo since last week's hearing has unfolded as a prolonged examination of Kavanaugh's behavior and past, but has not been accompanied by similar scrutiny of Ford's accusations. "Every single word that Judge Kavanaugh has said has been looked at, examined, picked apart by most of you in this room. But no one is looking at whether or not the accusations made are corroborated, whether or not there's evidence to support them," Sanders said. McConnell warned that the decisions made by senators would not be influenced by protesters invading their offices on Capitol Hill or confronting them in airports or at home. Still, Kavanaugh's fate is not entirely in McConnell's hands. Should all the Democrats stick together, he can only afford to lose one Republican senator and still confirm Trump's pick. That means decision time is now at hand for Collins, Flake and Murkowski. Collins has been under relentless pressure from liberal groups in Maine to oppose Kavanaugh. But she needs to retain good ties with fellow Republicans to preserve her image as a pragmatist and moderating force in the party. Trump's attack on Ford put her in an even more difficult position -- one reason why she called the President's approach "just plain wrong." Like Collins, Murkowski has a political profile that is often independent from the wider GOP, especially after winning a write-in election eight years ago against a Tea Party opponent, meaning that her vote is difficult to predict. She also has a reputation as a senator who prioritizes women's issues and draws supports from some Democrats in her elections. Flake has been an outspoken critic of Trump. But he has often fallen back into line with party leaders in the end. But he is also retiring after the next election, so may feel more free to take a swipe at one of the President's legacy priorities. Democratic leaders cannot also feel completely confident that their caucus will stick together. West Virginia Sen. Joe Manchin, seeking re-election in a state overwhelmingly won by Trump in 2016, described the President's comments' on Ford as "wrong." But he said he remains "completely undecided" as he awaits the FBI report. CNN's Sunlen Serfaty, Dana Bash, Evan Perez, Ariane de Vogue, Manu Raju, Kaitlan Collins, Kate Sullivan and Phil Mattingly contributed to this report.